Time for another vendor profile! Let's get to know Alli Coate! Hi there! First things first: What's your name, what's your business name, where are you from, and where are you currently located/crafting? Hi! 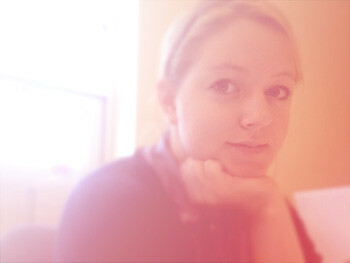 My name is Alli Coate, originally from Pembroke, Massachusetts and currently located in Providence, RI. How did you get your start? Please tell us a little bit about how your business went from an idea to what is is today. I have been making things ever since I was little, but first began working on products to sell when I was a student at RISD (the Rhode Island School of Design). I took a class called Entrepreneur with an artist named Oren Sherman, and it was the most fun I had ever had. It was great to bring ideas every week and get feedback from an encouraging group of peers. If that class hadn't existed, I think I still would have ended up making the things I am making now, but the class really helped me to recognize what I was strongest in and what belonged in my "brand." It can sometimes be very difficult to see this for yourself, so it can be incredibly helpful to have a few people around with opinions you trust. I love the challenge of figuring out how to make an idea work! Unfortunately this sometimes backfires on me; I'll spend a lot of time and energy designing and figuring out construction techniques, but once it's time to actually create the thing I'm already sick of it. Now I keep this tendency in mind when I'm dreaming up ideas. What are your favorite materials to work with? Do you have a favorite color palette? My favorite materials are fabric and thread. I am especially drawn to vintage and vintage-inspired fabrics, which tends towards a faded color palette that just adore. Who are some of your favorite indie artist/crafters and why do you love them? I love Laura Normandin. Everything she makes has the same careful consideration and touching simplicity. I feel the same about somethingshidinginhere. There is something about a really simple idea that just grabs you and stays with you. I love the kind of thinking that produces ideas that make you stop and say, "why didn't I think of that?" This holiday season I'm debuting a line of illustrated fabric products that I'm very excited about! 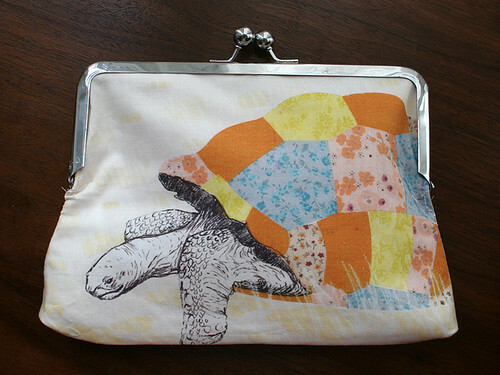 I've had my favorite illustrations printed on fabric and I've been making decorative pillow covers and clutches. I can't wait to get them into people's hands! What are some other things you like to do when you are not busy making awesome stuff? I love drawing, volunteering, and watching movies. Right now I'm on a documentary kick. I am also a dedicated podcast listener- my favorites at the moment are Radio Lab, This American Life, and Escape from Illustration Island. What are the top 3 reasons someone shopping at the BBB 2010 should be sure to stop by your table? 3- and free gifts to make you smile! What is your favorite background noise to listen to while working? It depends on the work- usually it's either podcasts or a movie. I definitely get my money's worth out of netflix! Unfortunately my work area is usually in chaos! I have a few "stations" throughout the house, and usually end up trailing my projects around and making a big mess. If you had to contribute something you made to a time capsule to be opened in 2110, what would it be and why? 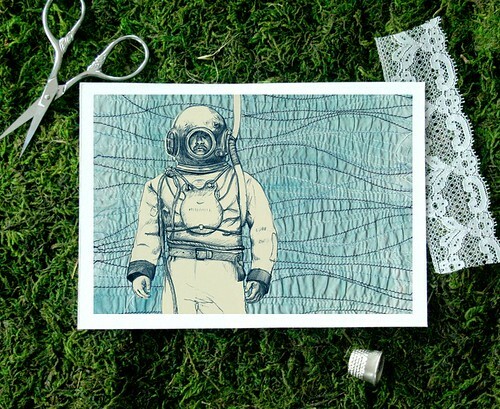 My sister thinks the scuba diver in my illustration looks like a space man- maybe the future-humans will think so too?